We didn’t know much when we started our wedding planning 11 months ago, but we did know that we wanted to throw the greatest pizza party ever and we wanted it to be outside. We won’t bore you with the details of planning, but we will say this: http://www.accuweather.com’s 30-day out weather report is the worst thing that ever happened to a couple planning an outdoor wedding. Any reasonable human will tell you that it’s impossible to predict the weather that far out, so naturally the forecast for June 15 would change every other day. Gorgeous and sunny! Horrible and stormy! Overcast but that’s alright because it’s good for pictures! Didn’t matter — what http://www.accuweather.com said was gospel, and we were going to be prepared. Ten days out, the weather looked like it was going to be nothing but rainy. Kathleen freaked out, ordered a 24-pack of umbrellas from Overstock.com and paid to have it rushed to New Hampshire. The next morning, the report changed to show sunshine and blue skies, but it didn’t matter — those umbrellas were the best insurance policy we could have purchased because the weather for the wedding weekend was amazing. On the eve of our nuptials, we brought our football team-sized wedding party to the venue and breezed through the rehearsal. A bunch of pros, those kids. Afterward, we went to the River House in downtown Portsmouth for the rehearsal dinner, which featured both planned and impromptu speeches from our loved ones in a perfect blend of sappy and satirical. The party started to wrap up, but Mike just didn’t feel ready for the fun to end. “Don’t get too drunk,” were Kathleen’s parting words. She awoke the next morning to a text that warmed her heart while simultaneously making her stomach drop. But Mike, being the champ that he is, sweat it out during a run with his two best men early in the morning, followed by some rigorous bowling for all the dudes a little later. While he was displaying his athletic prowess, Kathleen was drinking mimosas and getting her hairs did with the gals. Believe it or not, it was actually a pretty low-key morning and we were both feeling quite Zen. And before we knew it, it was time to head to the venue. Everything was going well — except for the part when about 35 of our guests were accidentally led onto a bus that was going on a wine tour instead of the reception. Long story short, they all made it. Welp, you know what happens next… and major points were scored when Kathleen vowed to support Mike in his lifelong dream of bringing the Whalers back to Hartford. It was, without a doubt, the most fun we’ve ever had. 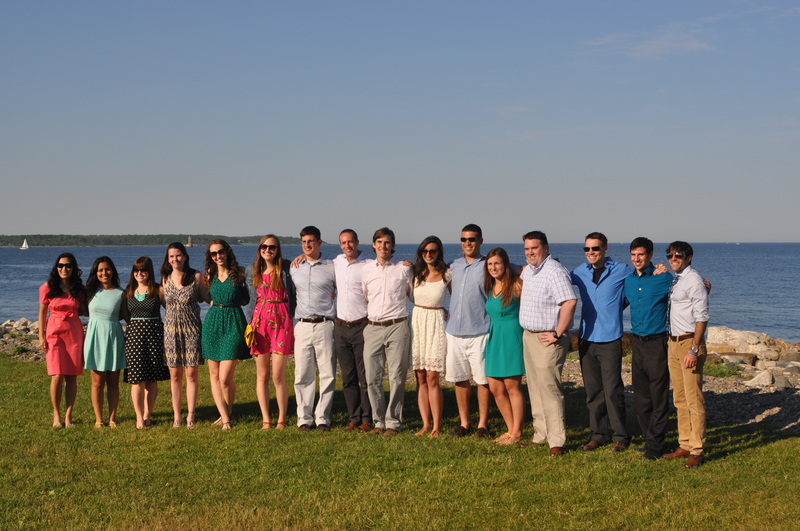 After the reception, the party continued in downtown Portsmouth and went into the wee hours of the morning. We capped off the entire weekend with a brunch the next morning. We absolutely adored every single one of our vendors and would, without any hesitation at all, recommend them to any engaged couple throughout New England. We could wax poetic about each one, but we also appreciate brevity. Here’s our list, with a few choice comments. 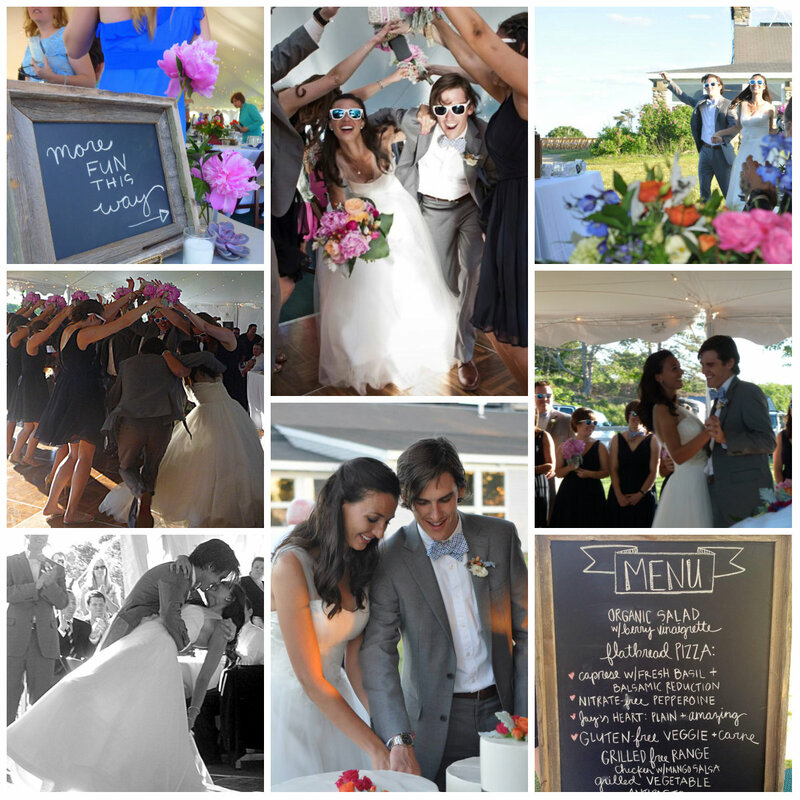 Venue: The Seacoast Science Center in Rye, NH, with coordination by the lovely Ashley Stokes. Tent Design: Kristin Burgess and the By Emily. B team. Kristin went above and beyond for us. Her talent is remarkable. Caterer: Jessica Z. and the team at Flatbread Company. They do more than just tasty pizza — we also had grilled chicken, roasted vegetables, organic salads, and more. So delicious. Bar/Other Logistics: Amesbury Sports Park. The ASP team is incredible. They know their stuff and they’ll make sure everything stays within your budget. Photographer: Liesl Clark of Claris Photography. This lady’s got an eye like no other. Her photos are knock-your-socks-off gorgeous. Cinematographer: Ron Risman of Cinematic Stories. Just watch the videos on his site. He’s a real storyteller. DJ: Christian Furze, who really knows how to read a dance floor and keep the party on schedule. Flowers: Flower Kiosk in downtown Portsmouth. Simply stunning arrangements. Without the help of these fabulous folks (and our loving parents, of course) our day could not have gone as awesomely as it did. Thanks again, all. Can we get Martyed every weekend? Previous Post Reduce, Reuse, Recycle: Our Wedding Website Turns Into Our Blog.